The country’s new president said Yahya Jammeh appears to have left the state coffers behind empty. BANJUL/DAKAR, Jan 22 (Reuters) - West African troops entered Gambia’s capital, Banjul, on Sunday, to cheers from the city’s residents a Reuters witness said, part of efforts to allow new President Adama Barrow to take office after the country’s former ruler fled overnight. Yahya Jammeh, who led Gambia for 22 years but refused to accept defeat in a December election, flew out of Banjul late on Saturday en route to Equatorial Guinea as the regional force was poised to remove him. A convoy of around 15 vehicles, including armored personnel carriers mounted with heavy machine guns and pick-up trucks full of soldiers, rolled down one Banjul street in the late afternoon, according to a Reuters journalist who saw them. City residents lined the road, applauding and shouting “Thank you” as the soldiers smiled and waved back. Troops were later seen entering the presidential compound, State House. The regional operation was first launched late on Thursday after Barrow was sworn in as president at Gambia’s embassy in neighboring Senegal, but it was halted hours later to give Jammeh one last chance to leave peacefully. His departure followed two days of negotiations led by Guinea’s President Alpha Conde and Mohamed Ould Abdel Aziz of Mauritania, prompting speculation over what, if any, terms were agreed to convince him to step down. Speaking on Senegalese radio station RFM, Barrow denied that Jammeh had been offered immunity from prosecution in exchange for leaving the country. “He wanted to stay in Gambia. We said we couldn’t guarantee his security and said that he should leave,” Barrow said. Earlier in the day, the African Union and United Nations published a document on behalf of these two organizations and regional bloc ECOWAS. In it, they pledged, among other things, to protect Jammeh’s rights “as a citizen, a party leader and a former Head of State,” to prevent the seizure of property belonging to him and his allies, and to ensure he can eventually return to Gambia. Barrow, speaking on RFM, said the document did not constitute a binding agreement and said that upon initial inspection it appeared Jammeh had looted state resources. Hundreds of Gambians who had fled the country began returning by ferry from Senegal’s Casamance region on Sunday. Jammeh’s loss in the Dec. 1 poll and his initial acceptance of the result were celebrated across the tiny nation by Gambians grown weary of his increasingly authoritarian rule. But he reversed his position a week later, creating a standoff with regional neighbors who demanded he step down. West African troops from Senegal, Nigeria, Ghana and Mali were deploying throughout Gambia on Sunday. Barrow did not say when he would return to Gambia but said it would be soon. At a press conference in Banjul, Barrow’s spokesman Halifa Sallah said a military aide would be sent on Monday to determine if security conditions permit the president’s return. 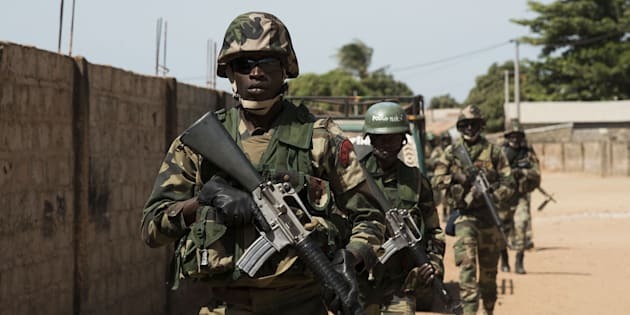 Two Senegalese military officers said the multi-national force had met no resistance from the Gambian army as they advanced on Sunday. Rights groups accuse Jammeh of jailing, torturing and killing his political opponents while acquiring a vast fortune - including luxury cars and an estate in the United States - as most of his people remained impoverished. The repression under Jammeh has forced thousands of Gambians to seek asylum abroad over the years. The repression has forced thousands of Gambians to seek asylum abroad over the years. An additional 45,000 people fled to Senegal amid growing fears of unrest in the wake of last month’s election, according to the United Nations. Hundreds of Gambians carrying sacks, suitcases and cooking pots began returning by ferry from Senegal’s Casamance region on Sunday. Hawa Jagne, 22, a cloth trader, hugged her sister Fama as she stepped off the boat.